Despite Only Modest Gains, More Record Highs on Wall St.
(Newser) – Stocks managed to post modest gains Wednesday on Wall Street, enough to set more record closing highs, the AP reports. Technology and health care stocks rose more than the rest of the market, while banks and phone companies fell. Johnson & Johnson rose 2.1% after the company asked regulators to approve a prostate cancer drug. Luxury goods maker Coach dropped 2.8% after saying it will change its name to Tapestry. The Standard & Poor's 500 index rose 4 points, or 0.2%, to 2,555. 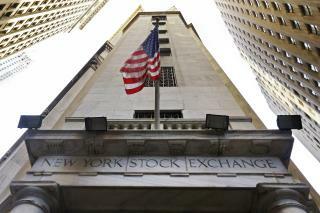 The Dow Jones industrial average rose 42 points, or 0.2%, 22,872. The Nasdaq rose 16 points, or 0.2%, to 6,603. All three closed at record highs. Small-company stocks lagged the rest of the market. The Russell 2000 index fell 1 point to 1,506. And if any of you think that this rise would be the same if HRC was in the WH, keep your head in the sand. The higher the market climbs, the bigger the fall it will have. There is nothing in the economy that supports its current level.